Do You Want to Build a Bridge to Financial Success? As the state of the economy dominates headlines, consumers are increasingly looking across the divide of bills and bad credit that separates them from financial success, and worrying. Do you have the knowledge and tools you need to use your credit wisely? Are you aware of the opportunity and responsibility that comes with credit? Are you empowered to meet your personal financial goals? During National Credit Education Week on April 20-26,2008, the ACA International Education Foundation will help consumers build a bridge to financial success by informing and educating them on the basics of personal finance, including credit, budgeting and consumer rights. By providing consumers with financial literacy information, the ACA International Education Foundation hopes to help consumers better understand the function and power of credit in our economy, while learning how to use credit wisely for financial success. "Credit is the basis of our economy, and it gives people great opportunities to buy homes, earn college degrees and start businesses," said Rozanne Andersen, executive vice president and general counsel for ACA International. "But credit is also a responsibility that must be understood and used wisely." Simple tips can help consumers achieve and maintain good credit. Tracking your spending and planning ahead for expenses is a simple way to live within your means. Keeping long-standing lines of credit open, even if they are not being used, benefits your credit score. And, putting a little something away every pay period, no matter how small the amount, will encourage the good habit of saving. Collectors are often the first people to engage consumers in a problem-solving dialogue about their unpaid bills and help them find solutions. Consumers may not know that there is no such thing as an unpaid bill. If individuals who are extended credit for goods and services don't pay, everyone else picks up the tab through higher prices. On average collectors save American families $351 a year in money they otherwise would have spent in increased costs for goods and services. During National Credit Education Week, ACA International member organizations and their employees across the nation will leverage basic tips and information to educate consumers on ways to achieve and maintain financial health. In addition to presenting information on consumer rights, members will distribute a personal finance quiz to test and improve knowledge about credit. Members will promote the online web course in credit education. To take the free web course, and learn more about the ACA International Education Foundation and National Credit Education Week, visit http://www.nationalcrediteducationweek.com. As ACA International's philanthropic arm, the ACA International Education Foundation coordinates several programs to help members give back to the communities where they work and live. The ACA International Education Foundation strives to increase financial literacy through research, education, job training and public relations initiatives. 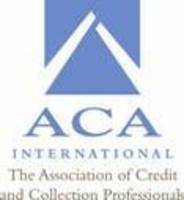 ACA International, the Association of Credit and Collection Professionals, is the comprehensive, knowledge–based resource for success in the credit and collection industry. Founded in 1939, ACA brings together more than 5,500 members worldwide, including third–party collection agencies, asset buyers, attorneys, creditors and vendor affiliates. The association establishes ethical standards, produces a wide variety of products, services and publications, and articulates the value of the credit and collection industry to businesses, policymakers and consumers. For more information about ACA International, visit http://www.acainternational.org.